Prime Minister Narendra Modi was in Agartala in December 2014 to dedicate the second unit of ONGC's Palatana to the nation. People gathered in large numbers to listen to him. Invited to the ceremony was Tawfique-e-Elahi Choudhury, advisor to Bangladesh Prime Minister Sheikh Hasina, who had helped in setting up the plant by allowing transshipment of equipment via Bangladesh. Yes, the “wow” factor of Indian democracy that struck the Bangladeshi guest three years ago has come into a full play after the Tripura Assembly results on Saturday. What once was the CPM’s impregnable citadel, where Manik Sarkar ruled since 1998, collapsed like a house of cards in the face of people’s desire for change. Sarkar, 69, is known as an affable and austere chief minister. People loved him and may continue to love him even now. Tripura was one of the best-administered states in the northeast where human development indicators like literacy, health, and cleanliness are better than many other higher states. But it lacked economic prosperity as industries shunned the state in spite of Sarkar's attempts to aggressively woo them. Unlike CPM, which has built its cadre and party-infrastructure over decades, BJP was a new political entrant to the state. Till 2014, it was literally impossible to even to think that BJP would ever be in the race to claim power in Tripura. 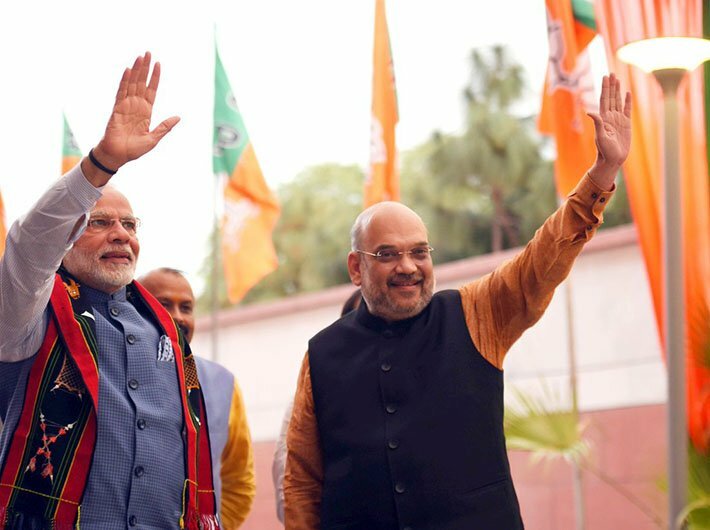 The party’s victory in Tripura is nothing short of a political miracle that has been made possible by sheer perseverance and political perspicacity. The BJP leadership correctly diagnosed the people’s pulse and weaved a narrative that captured their imagination. And this narrative, distinctly different from the worn-out Marxist phrases and socialist idioms which were in circulation for decades, focused on building Tripura as a model of development. Ironically, in Tripura, the state is the biggest employer. And as compared to other states, the Manik Sarkar government has been vacillating on the implementation of successive pay commissions since the fourth pay commission. This prevarication has caused a huge resentment among the government employees who act literally as opinion makers. The BJP has won over the employees by promising them to get their dues. Given the fact that the Centre is ruled by BJP, the assurances carried more weight than similar promises by either Congress or CPM. But what appears to have taken the CPM leadership off guard is its inability to realise that the mood of the people in the tiny state is no longer enamoured of traditional Marxist-socialist platitudes. The shopping malls in and around Agartala and the students who throng these complexes in the evening are a clear testimony to people's yearning for change. Ironically enough, the only leader who anticipated this wind of change was Manik Sarkar. He made a determined attempt for course correction but was stone-walled by traditionalists within the party. For instance, he invited industrialists to invest in the state to spur economic growth. Given the fact that the state has a lower per capita income compared to the national average, Sarkar saw the limitations of state-sponsored growth in the state. In a candid conversation with me, he had said that the state desperately needs private investment. Read the interview: "Tripura offers an alternative model of development"
And that was the precise reason why Sarkar did make an attempt to mend fences with the Centre. He personally developed a very good rapport with Prime Minister Narendra Modi and invited him to address his cabinet — much to the chagrin of the CPM leadership. Sarkar’s pragmatic politics found an ideological roadblock erected by puritans led by Prakash Karat. His every attempt to reorient the party to the changing axis of politics was thwarted as CPM took a rigid stance against the rising BJP, giving the latter an opportunity on a platter to weave a counter-narrative. On the other hand, BJP captured the imagination of a large section of state employees by promising a better lifestyle and emancipation from a political dogma that has been keeping people perpetually in the thrall of penury and backwardness. Given the fact that Tripura is one of the states where RSS has a strong foundation, BJP lost no opportunity in building up its cadre base, largely drawn from Congress, on the foundation of a strong RSS network. Weary of a regime which is blindfolded by its own ideological limitation, BJP’s counter-narrative found resonance among people. This victory of BJP in Tripura is quite akin to a tectonic shift in Indian politics probably comparable internationally to the collapse of the Berlin Wall or of the Soviet Union. It signifies collapse of an ideology which ceded ground to another powerful ideology. In essence, BJP has occupied the political space which once belonged to Congress in post-independent India. And the greatest testimony to our democracy is that all this has been attained through the ballot.